The time has come for the volleyball community to get their tickets and help support the largest annual college men’s volleyball non-conference tournament. 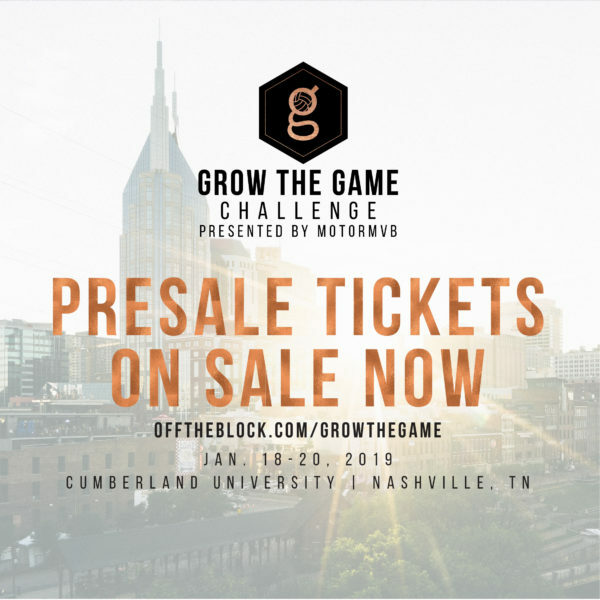 Tickets and fan experiences went on sale Thursday for the upcoming Off the Block Grow the Game Challenge presented by MotorMVB that will take place Jan. 18-20 at Cumberland University in Lebanon, Tennessee. Tickets are $8 for a day pass and $20 for a tournament pass that will be good for all 13 matches during the three-day event. Fans also have the option of packages that include additional experiences such as performing the ceremonial first serve, picking the prematch music playlist, receiving a match-used Molten volleyball and getting to go into a team’s locker room to hear a coach’s prematch speech to his players. Individuals unable to attend the tournament can still support the Grow the Game Challenge by purchasing tickets that will be donated to the Nashville community. All the money from ticket sales and fan experiences will go towards financing the Grow the Game Challenge, which operates as a non-profit organization. The 2019 Grow the Game Challenge will feature 10 college men’s volleyball teams and will be divided into two divisions based on each school’s NCAA or NAIA affiliation. Below are all the ticket and fan experience packages available to fans for the Grow the Game Challenge. Visit a team’s locker room before a tournament match to watch the coaching staff’s prematch speech to their players (some restrictions based on head coach’s approval). An official match-used Molten volleyball from a match during the Grow the Game Challenge. Admission to the tournament’s VIP and hospitality suite. You get to go behind the service line and serve the ceremonial first serve before a match during the Grow the Game Challenge. You get to determine the musical playlist that will be played in the arena during the team warmups of a tournament match (some restrictions to songs do apply). Official Grow the Game Challenge t-shirt. Four tournament passes (each pass good for admission to all 13 tournament matches). 25 day pass tickets that will be donated to the local community. As a thank you for your generosity, you receive an official match-used Molten volleyball from a match during the tournament and an official Grow the Game Challenge shirt. Option of you performing the ceremonial first serve before a tournament match OR picking the musical playlist during prematch team warmups of a tournament match (some restrictions to songs do apply). Two tournament passes (each pass good for general admission to all 13 tournament matches). Tournament pass (general admission ticket for all 13 tournament matches). Tournament pass (general admission ticket for all 13 tournament matches; pass can be donated to a member of the Nashville community if you are unable to attend the event). General admission ticket to all 13 matches of the Grow the Game Challenge. Can’t attend the event but still want to help, no problem. This option lets you buy a tournament pass for all 13 matches that will be donated to the local community. Single-day general admission ticket for the Grow the Game Challenge. You can select the day you want to use the ticket, and it’s good for all matches played that day of the tournament. Can’t attend the event but still want to help, no problem. This option lets you buy a single-day general admission ticket that will be donated to the local community.